Aussie Farms’ map — just shut them down or engage the ‘silent majority’? 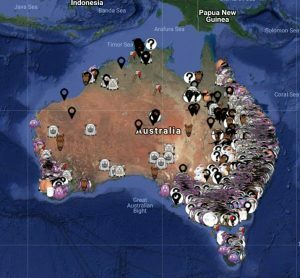 HYSTERIA over the release of a map produced by animal activists showing the locations of Australian farms, feedlots and processors is not fully warranted, according to Victorian agricultural consultant Nathan Scott. Farmer bodies, agvocates and the Minister for Agriculture David Littleproud have reacted angrily to the animal rights charity Aussie Farms publishing the locations of hundreds of farms, feedlots and processing plants without the owners’ permission. “A quick search of some key words in Google Maps will produce plenty of locations of farming enterprises of all types. “What Aussie Farms have created isn’t rocket science and I don’t believe it is the end of the world either,” he said. Mr Scott said people with extreme views intent on breaking the law and entering a premises unlawfully to commit a crime don’t need a website to help them. “The law will deal with them in any case. “For the wider public, the everyday consumer who may have been caught up in this hype, if they are interested in what happens at these locations then show them,” he said. Aussie Farms executive director Chris Delforce has defended the map, saying “consumers are being withheld crucial information about the reality of modern animal farming, to the point of deception, and we have released this map to encourage transparency and consumer awareness”. The interactive map urges the uploading of documents, images and videos associated with the farm or facility, but also lists links showing “photos from similar facilities” of wounded, dead or distressed animals. A stud sheep farmer listed on the website said the group appeared to have its own set of rules. He would continue to have sale and open days, but will consider increasing farm security to counter any trespassers or protesters. 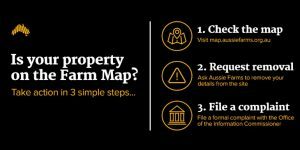 The operation’s website already contains Google Map location directions, but he believed Aussie Farms’ actions are an invasion of his privacy and he will investigate options to get the farm location from the map. The sheep breeder was more concerned about Aussie Farms listing photographs through a link on his farm’s map reference that were not associated with the operation. Tasmanian farmer George Gatenby put a link to the ABC’s coverage of the story on his Twitter page and defended livestock farmers. “Our gates are always open, we welcome anyone that would like to visit our property and see how food & fibre is produced. “Australian farms have the best quality assurance programs in the world & have people that care for their animals more than themselves,” he wrote. The National Farmers Federation has said Australian farming families are under siege from “a malicious social media campaign run by an extreme anti-farm group” which believes that animals should not be owned for human purposes. NFF president Fiona Simson said the implications could be dire and has demanded Facebook close the page promoting the Aussie Farms map immediately and for the group to be stripped of its charity status. The NFF has also started a campaign to urge those listed on the website to ask Aussie Farms to remove their details from the site and complain to the Office of the Information Commissioner. On Monday, Mr Littleproud said the Aussie Farms map was irresponsible, “an anonymous farm-shaming website with no real outcomes for animal welfare” and potentially encouraging activists to trespass and worse after being misled about the practices on that farm. Trespass also has the potential to cause significant bio-security issues, he said. “Putting the locations of farms online could be creating an attack map for activists. This will potentially result in illegal behaviour by activists. Mr Littleproud also today called on state governments to review and beef up trespass laws following the Aussie Farms “personal address scandal”. The minister’s statement said he had received preliminary advice that is there is little the Federal Government can do about Aussie Farms putting the personal addresses of thousands of farmers online – but state governments can adjust trespass and other criminal laws as they see fit. “The risk of trespass and farm vandalism is higher since this website went up and state governments need to respond with laws that punish trespassers and vigilantes. “However, giving out names and addresses of individuals family businesses and homes, insinuating that they are criminals because they farm livestock and encouraging illegal activity through trespassing and stealing animals is under no circumstances acceptable and I suspect in breach of the privacy laws. “It certainly doesn’t pass the “betterment of the people” charity test,” she said. Ms Marriott said Aussie Farms’ behaviour can be compared to the promotion of all families names and addresses if they have children, encouraging people to break in and take photos in case there is child abuse happening. “It is so unreasonable, to almost be unbelievable. “The industry is constantly improving their processes and sometimes people do the wrong thing, however; there are legal reporting mechanisms in place through the police and animal welfare officers to manage these situations,” she said. “It is absolutely not the role for a charity moonlighting as experts in animal welfare to promote illegal and frightening activity. However, he said farmers, by opening their gates could engage directly with people that represent the majority. “The silent majority — the everyday person in the street that are currently observing what looks like a bunch of crazies from either side yelling at each other on a number of topics. “Enough of the yelling on social media, it is time to properly engage with those that matter,” he said. “While our industry continues to engage in this unproductive aggression, we will slowly erode the good standing we have enjoyed with our everyday consumers. “If there are laws broken in publishing the map, then it should be dealt with,” he said. “If not, we need to stop yelling and get on with showing the world how good we are, and how much better we still want to be. “They are rightly distressed that their name has incorrectly been linked to ‘animal cruelty’. She said Aussie Farms has been linked to a number of trespass incidents, including an incident in December where 55 protesters forced their way into an abattoir in Nhill, Victoria. “Their agenda is simple and straightforward: they want to see an end to farms, and that means an end to many farmers and the contribution they make. Ms Simson said she would write to police in each state and territory, alerting them to the ‘library’ of imagery on the Aussie Farms website, and questioning how the material was collected. The NFF is also seeking legal counsel on the implied link the map makes to the farmers represented and animal cruelty; and in regards to any potential infringement of privacy and trespass laws. NSW Farmers vice president Chris Groves said that the clear purpose of Aussie Farms was to attack the integrity of farmers and encourage further trespassing by activists. The association is calling on all level of government to undertake immediate action to protect farmers from increasingly dangerous tactics from activists. While there are legitimate concerns about the organisation itself and its effectiveness as a body representing the interests of consumers, farmers and producers need to take a deep breath and think calmly before reacting in any sensational way. This is just playing into the hands of Aussie Farms and portraying a knee-jerk response to an eager, ill-informed media. After spending many years involved in and promoting agriculture at many levels, I have learned that an ability to listen and engage in meaningful discussion almost always takes the conversation down a path of educating, informing and engaging; not being defensive, not being apprehensive and not being aggressive in responding. Often nothing you will say will change someone’s mind, but you will always have your credibility recognised if you speak with authority, but also empathy, knowledge interest, of course conviction and also concern for the other point of view. Too often our wonderful industry responds to things like this as a reaction rather than seeing an opportunity for promotion. We desperately need to be more proactive, unified in our approach and confident that our industry representatives are doing their job and acting on our behalf.